Many people do not consider a stainless steel countertop for their home because they cannot see how the shiny metal of the stainless steel will fit into their existing kitchen décor. These types of countertops are taken out of consideration in the beginning of the decision making process because it may be hard for the homeowner to imagine how the countertop will look in their home or what type of cabinetry and fixtures would complement the countertop. Stainless steel is one of the most versatile decorating materials around because the metal will complement any color or style that the homeowner desires without overshadowing the décor items that are placed in the room. When placed with lighter colors, the stainless steel countertop will appear to be light gray and bright as it reflects the colors that have been used in the room. If the stainless steel countertop is placed with darker colors, such as maroon, navy blue, and dark gray, the shine of the metal takes on a darker hue because there is not a great deal of light reflecting off of the walls to brighten the shine of the countertop. This natural adaptation to whatever colors are placed around it makes a stainless steel countertop one of the few countertop types that will match any type of home décor. 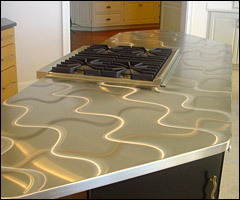 Stainless steel countertops adapt to the look of many different types of base cabinetry as well. Some homeowners choose to place these countertops on cabinets made out of wood for a great contrast between the countertop and the cabinets. Stainless steel pulls may be added to the face of the cabinets to draw the entire look together and add a modern feel to the kitchen. Some other homeowners decide to add the stainless steel countertop to cabinets that are painted a specific color, using the countertop as an accent piece for the rest of the kitchen area. Using the countertop in this way places the main focus of the kitchen on the cabinets instead of the countertop and the countertop reflects the colors of the cabinets for an interesting effect. Black is the color most often used to accomplish this effect, but any color for the cabinets would achieve a similar effect. If the homeowner would like the countertop to be the focus of the kitchen area or does not like the look of a plain stainless steel countertop, it is possible to purchase a stainless steel countertop that has a design or pattern on it to make the countertop look more interesting. These designs can be anything from geometric shapes to amorphous lines creating a unique look for the countertop. When choosing a stainless steel countertop manufacturer, inquire about what different designs the manufacturer has for their stainless steel countertops. Stainless steel countertops can also be manufactured in a number of different shapes and styles to better fit in with the homeowner’s existing home décor. Seeing a stainless steel countertop created in a crescent shape or a circle is not uncommon, and many other shapes, such as triangles and trapezoids, can also be easily accomplished when using stainless steel material for the creation of the countertop. There are many different options available for stainless steel countertops that can make them a welcome addition for any home.